Andy Biggs is a special kind of crony, incompetent and corrupt public servant. Being a member of the ultra-conservative Freedom Caucus (a group of elected officials whose sole mission is to demean, degrade, and reduce to rubble the government they have been elected to serve in while glorifying the free market and all things conservative), the current incumbent in Congressional District Five favors policies that hurt the common person but help the affluent and Dark Money Interests. As a state and federal legislator, he has opposed and attempted to stymie measures to improve and expand Kids Care, Medicaid, a woman’s right to choose, and LGBTQ rights. Such a “public servant” is not the optimal choice to lead the Congressional Five House District forward in Arizona. The current territorial composition of Arizona Congressional District Five contains all or parts of Mesa, Gilbert, Queen Creek, and Chandler. The district in its current form has been solidly in Republican hands since 2012. This year two Democrats are vying for an opportunity to defeat Mr. Biggs. One is Jose Torres and the other; the subject of this interview is Joan Greene. 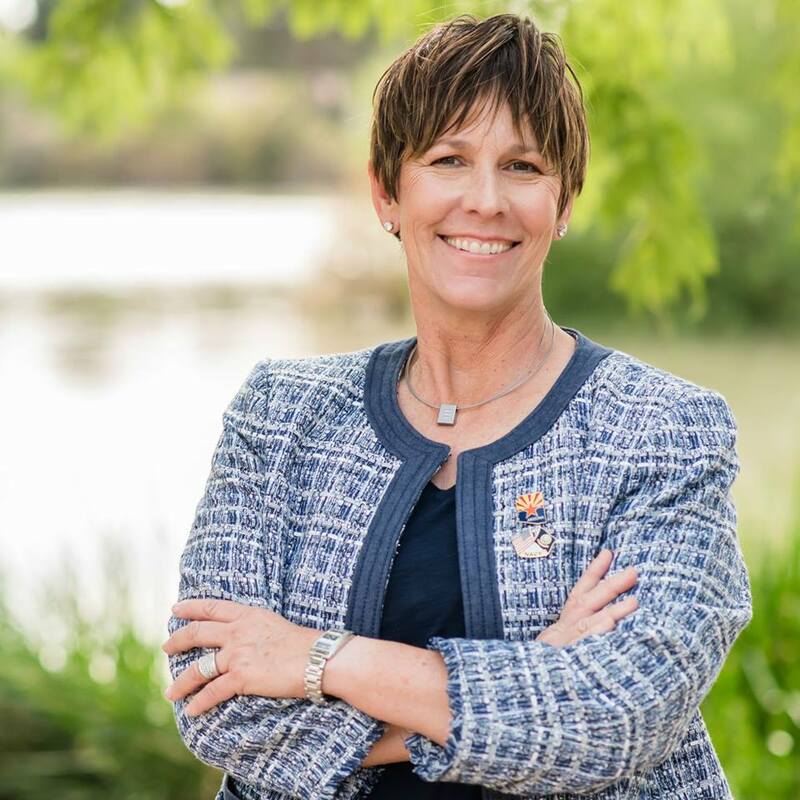 Below are Ms. Greene’s responses to a series of questions, some answered at SoZo Coffeehouse in Chandler and others through written responses, regarding the issues facing the people in the district and how she would act as the districts next Representative. Please tell the readers about your background and preparation for the office you are seeking? What are at least three local issues the people in this district view as needing to be addressed? “Listening to the experts and providing realistic solutions is how I will lead. My opponent listens to his donors and believes in the slash and burn method with zero replacement or solution. He is a destroyer and I am a builder. If we govern with the idea that everyone benefits, governing is easy. We need to invest in policies that build up the people; living wages, infrastructure, taking care of seniors, families, and providing peace of mind. Furthermore, she maintains that her opponent does not address the important issues the constituents in CD5 are talking about such as; Veterans, homelessness, helping abused women, jobs, health care, Social Security, Medicare, Medicaid, protecting our older adults and disabled community, environment, to name a few categories. Instead the incumbent cares more about submitting a bill that allows switchblade knives to cross state lines, all because a campaign donor wanted it. The goal of public service, according to Ms. Greene “should be to make things better” for the people. The people of CD5 are starving for their Representative to be accessible, transparent and honest, which I am. Would you put this district in the Liberal Progressive or Pragmatic Progressive Camp or Centrist? She considers herself a Moderate Democrat who believes you have to be “open to new ideas and have the skills to look at issues in a different way. We must ask ourselves, “How can we make this particular idea work”? Sometimes we have to say, “This is a great idea but we need to do ‘a’ and ‘b’ first before we get to the final ‘c’. It’s OK to zig or zag because like life, sometimes there are detours we take to get to the final destination”. What are two reasons your message is better than the Republican one of your opponent for this district? Student Loans and Pell Grants “We must expand Pell grants most Pell grant money goes to students with a total family income below $20,000. This is why education is so important so the recipients can close the economic gap.” She believes paying off student debt over twenty years is a drain on the economy and she would like money going to loans shifted to grants where the people are not burdened by debt and can spend it while growing the economy. She chastises her Republican Opponent for being in the “pocket” of banking interests. Broadband – “We must make sure every area of our Country (like Power Ranch in her district) is covered with high-speed reliable Internet service. The internet is no longer a luxury but is a tool we use every day” Examples would be telemedicine or people who receive their education online. Natural Resources – Arizona is a state rich with natural resources and a great diversity of habitat, landscapes, plant life, and wildlife. I consider our public lands and parks to be our natural resources. They provide a benefit to our economy through tourism and jobs. The people who want to mine are the companies who will line their pockets as they destroy our eco-system and take from our children and grandchildren the opportunity to experience our unblemished nature, the way it was meant to be. Cultural like theaters and symphonies – As a drama major I feel that arts are an important part of the total life experience. This provides jobs and increases the favorability score for cities that do have a thriving arts center. Good Paying Jobs – “$15 is the number that is talked about but to be able to rent a 2 bedroom apartment you need to earn at least $18.40 and higher depending on where you live. This also ties in with affordable housing.” It has been shown that the economy will grow because people have money to spend and that will save the federal government money because we will not need to pay for safety net programs for some people. Obamacare, Medicare for all, or something else? “Medicare for all. This is what everyone wants. This is not a partisan issue.” She feels that this “needs to be done in steps with first fixing ACA, then lower the age to buy into Medicare at 55 and then we keep lowering it until it is second nature and it is available for everyone. Should the government negotiate for cheaper drug prices?“Of course and this is a major platform for me”. Reducing Poverty and Homelessness like affordable housing, food stamps, work requirements, and raising the minimum wage and earned income tax credit. “I am becoming acquainted with the Universal Basic Income and will be doing more research on this concept which sounds interesting and doable if we move to spend on certain anti-poverty programs around to this idea. Until then we need to raise our minimum wage so people do not need to work two jobs to make ends meet. This frees up the 2nd job so someone can have a first job.” She also feels that people who cannot work because of physical limitations but still want to be productive and contribute to their community can become volunteers like reading to children or being teacher’s aides. Do you support a wall? “I do not support a wall and neither do the majority of Americans, including those who live in AZ, other border states and those who live on the border. There are other ways to secure our Borders that provide jobs and use technology which will save us from wasting billions of our taxpayer dollars that should be going back into our Communities to help our citizens. Presidents shift to Authoritarianism – “Those who can’t lead, bully. We see this with the current congressional district 5 Representative Biggs. Corruption, cronyism, and incompetence. Our American Values are to extend our hand to people in need. We need to go back and become the country of WE and not become the country of me. P.A. and Green Energy – “We must take back the E.P.A. from the corrupt cronyism and incompetence. Our public lands and the quality of our lives are being sold off to the lowest bidder so they can line their pockets. We should be the leader in Green Energy but because of the corruption, we are lagging behind other countries. This hurts the health of the people, the planet and economically. Our endangered Grey Wolves are in danger of being slaughtered all because he does the bidding of the ranchers who give him money and they want them gone. “The enthusiasm and engagement for our message of change and ‘Together we thrive’ is through the roof. Everyone wants the corruption, cronyism,and incompetence gone from politics and they will start right here in CD 5 by voting out the incumbent.” They have over a hundred volunteers and the number of recruits is rising. Unlike Biggs, they have traveled everywhere in the district and listened to people from our low-income families, our wealthy families and everyone in-between. Joan Greene is a very determined and passionate candidate committed to improving the lives of everyone. All forward-looking voters should consider this election season. For more information about Joan, please research the sites below.